Recently Erin (Http://www.collectcreatecirculate.com) contacted me and asked if I would be interested in answer a few business-based questions for a course that she is taking at Iowa State University. Of course, I agreed, I do love to talk! It was a thought-provoking interview and I really enjoyed answering her questions. I thought it would be a fun insight to share some of the questions here on the BOMQ website. What education did you have prior to starting your business? I worked in fast food, so I joke that I have a degree in French fries. All kidding aside, my education is limited to community college. What was your previous occupation before you started your own business? I was a manager of a fast food restaurant….would you like fries with that?? Does your family have any background as entrepreneurs? This is my one advantage, my husband is an entrepreneur as well. I have learned so much from him and have benefited from his experiences. Besides my husband, my business role model would be Mark Cuban. I am in awe of what he has done. I wanted to quilt as much as possible and I couldn’t make quilts fast enough. Not really the most inspiring start, but hey, it’s the truth. Did you have any goals when you were just starting out? I have always been very goal oriented. My first one was to have just one person pay me to quilt their quilt for them……I achieved it. How did you fund your business in the beginning? Since I already had the machine, I didn’t need a lot of funds. I am a huge believer in starting small and building as you go. Having the stress of debt makes it hard to be creative. Did you consider having any partners? Nope, I subscribe to Dave Ramsey’s theory, “the only ship that won’t float is a partnership” I do have a great support group around me though and that has made all the difference. In your blog you’ve mentioned that you kind of just fell into this business without a plan, but have you at any point sat down and prepared a more traditional business plan? Not in traditional sense. I have more of a “future plan”, what I want to accomplish in the next few years. Have you faced any major challenges or problems while running your business (or starting one)? If so, how did you solve it? I started as a painter who grew into fabric work because I longed to create landscapes that could be touched. I slowly morphed into embroidery and quilting and am now in the planning stage to embark on a career of long-arm quilting for hire. My biggest obstacles so far have been my impatience (I want to be hands on with quilts for others right NOW!) , and trying to come up with the financing for the HQ Avante 18 that I dream of having soon. I’ve been doing my own quilting on my DSM. 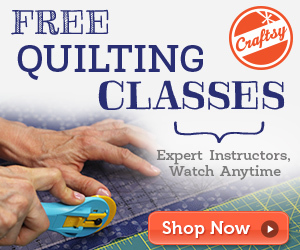 Recently while researching quilting, I ran across your book on Quilting Modern Quilts “Free Motion Quilting.” That, this website, and a Webinar you gave for HQ on the 3 biggest mistake you made at the beginning of your business, have helped me to plan better, put things in writing, and set goals for my next few years! Thank you! I love that your first goal was just to have one person pay you to quilt their quilt. I am really bad about figuring out little goals. I can do the long term goals, but it’s hard for me to break it down into bite sized pieces to measure my success. Right now, I don’t have a business. It’s so hard to wait! I’m ever so slowly saving up money to buy a longarm, but I will also need to figure out a place to put it since there isn’t a room in my house that’s big enough for one. We’re putting most of our money into trying to pay off our house early to give us much greater financial freedom, so I have very little to put back towards the business I would love to have someday. I want to start out debt free so the business can grow without me having to stress about paying off the machine. Right after I started my quilting business, I started having a bunch of issues with my eyes and had 8 eye surgeries in the first 2 years of my business. I am now legally blind in my left eye, and I think people believe I can’t see well enough to do a good job of quilting. I am proving that I can quilt with one eye, and I quilt tiny surprises into my customers’ quilts. I think my biggest challenge in getting my long arm quilting business going has been “time”. Just finding time to work on it and practice so I feel more comfortable so I can be “ready” to take on customers. It is so hard when you have another full time job, a family with two little kids, and a household to maintain. That is something I have definitely been struggling with! The biggest issue that I have is trying to figure out how I can design quilts and run a longarm business too. I am an artist and a quilter, that makes for some interesting days. Open for suggestions,because I have not solved the problem yet.